The Ukrainian opposition rejected an amnesty bill adopted by the parliament, which requires that protesters vacate occupied government buildings. Opposition leaders demand an unconditional amnesty and pledge to continue their protest. Once signed into law, the bill will offer blanket amnesty to all participants of anti-government rallies, with the exception of those suspected of major crimes, like murder or kidnaping. The amnesty is to come into force automatically after the general prosecutor confirms in an official statement that the protesters have ceded all government and administrative buildings in the country, as well as some streets. The latter do not include the sites of peaceful protests, like Kiev’s Independence Square and European Square. The bill sets a 15-day deadline for the opposition to meet the conditions. 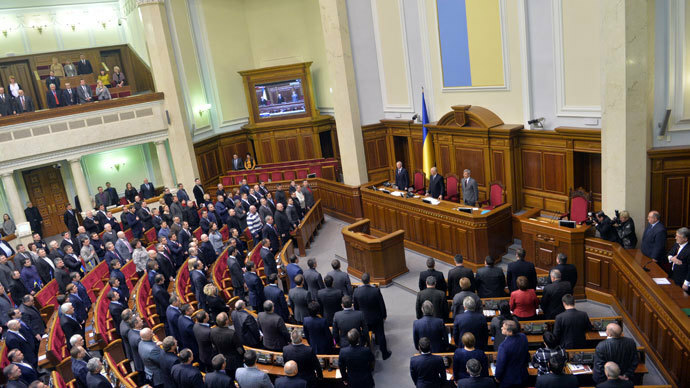 The amnesty bill was submitted by the ruling Party of Regions and supported by 232 of the 450 total members of Ukraine's unicameral parliament. It was one of four competing amnesty bills on the floor during the emergency parliament session on Wednesday. The party said the amnesty is the third major concession in the past few days made in response to the opposition demands. “[This legislation] provides for steps for both the authorities and the opposition. They relinquish the seized buildings; we relinquish participants of the clashes from responsibility. It’s called compromise. But if they don’t hold their part of the obligations, the law ‘dies’ and no amnesty takes place. So of hundreds of people are punished for violating the law, the blame would be fully on [opposition leaders] Klitschko, Yatsenyuk and Tyagnibok,” explained Mikhail Chechetov, a Party of Regions MP. But the opposition does not appear to see the deal as fair. Opposition lawmakers refused to support the draft, saying that detained protesters must be released without any preconditions. After it was passed, they said they would challenge it on procedural grounds. “The law was adopted in clear violation of [parliamentary] rules, it wasn’t discussed in the committee. It was absolutely illegitimate and illegal. This law shouldn’t be recognized,” said the leader of the nationalist Freedom (Svoboda) opposition party, Oleg Tyagnibok. “They are trying to make us responsible for the situation in the country,” the politician said. Arseny Yatsenyuk, leader of the opposition Batkivshchina (Fatherland) Party alleged that the government wants to ‘shut down the Maidan’ with the amnesty law. Opposition UDAR party leader Vitaly Klitschko believes that the new law will only increase tension within Ukrainian society and will not help to ease the political crisis. “Instead of lowering the tensions in the community, the temperature will rise,” Klitschko said. On Tuesday, Prime Minister Nikolay Azarov and his cabinet resigned, and parliament voted 361-2 to repeal recently passed anti-protest laws. Nine out of 12 anti-protest laws were repealed. 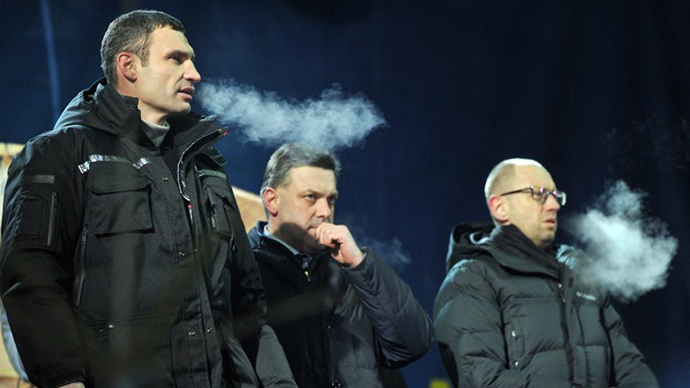 Days before that, President Viktor Yanukovich’s offered Yatsenyuk the role of chairman of the new Ukrainian government, with Klitschko getting a ministerial position in it. Both opposition leaders rejected the offer. On January 16 Ukraine’s parliament, the Verkhovna Rada, passed controversial anti-protest laws that imposed strict punishments for violators. The new legislation sparked mass protests, which quickly transformed into violent riots on Grushevskogo Street. 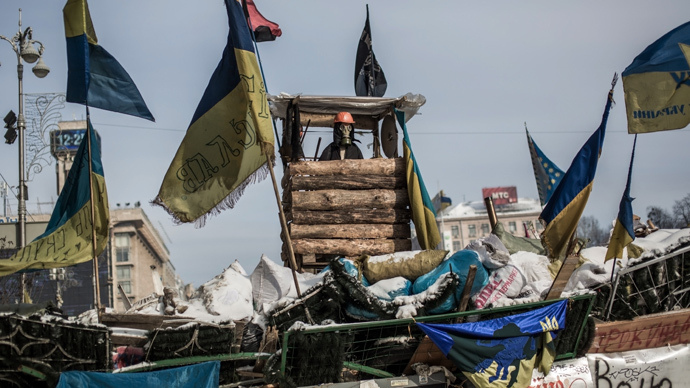 The damage from protests in Kiev is estimated to be at least $2.5 million, the city administration said Wednesday.